ViewProtect design and manufacture transparent safety and security barriers for the global market. Our advanced Smart Bar technology products have the unique ability to combine the age-old, dependable physical security barrier system with new, sophisticated alarm monitoring systems to create the ultimate security product. This patented Smart Bar technology makes it possible to provide around the-clock protection, while providing an aesthetically pleasing transparent barrier in the home or workplace at an affordable cost. The Smart Bar technology, which is made up of LEXAN polycarbonate clear bars, are at the forefront of physical security products and provide unmatched protection. With a product line-up that includes with state of the art Armed Bars, Safety Bars, Trojan Gate, ClearTrellis and HotLock systems. Different fixing options were developed to allow our customers the choices that suit their design and price. For the first time ever, consumers are now able to have 24-hour alarm protection while maintaining their ordinary movements in and around their property. Our products have high tech advantages backed with old fashioned service giving you added value throughout our product range. All our products undergo strict quality control. With trained personnel who specialize in the manufacture and assembly of the Smart Bar Technology product range, we are better equipped to supply a far more superior product. Further additions to this high-tech range of products are currently under construction. 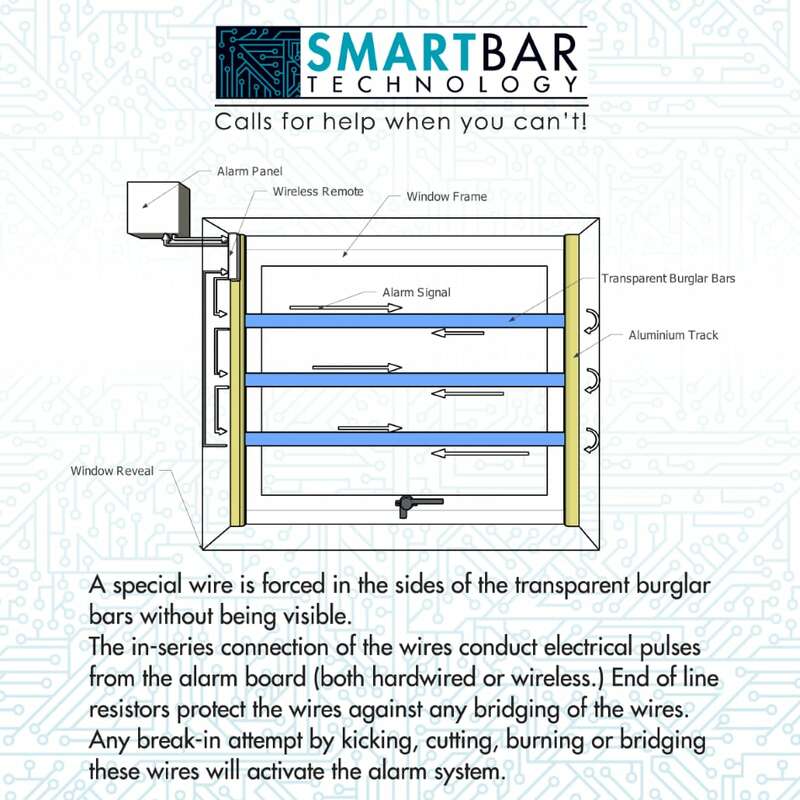 Smart Bar technology is a transparent security barrier which is manufactured from polycarbonate material and has been armed with a specially designed thin wire on both sides of the bar. These wires are in-series connected and is not visible when looking through the bar. Physically strong transparent barrier – made from approved LEXAN polycarbonate material that is aesthetically pleasing with impeccable, high-impact strength. This material is typically used by police officers as shields during riots, bullet resistant and airplane windows. The barriers are armed 24/7 – The Smart Bar technology allows for a thin wire to be securely wedged in specially made grooves on either side of a transparent polycarbonate bar. The wire can be connected to any alarm monitoring system and will provide the most secure alarm sensor. This will provide you with a permanent armed perimeter protection. The in-series connection of the wire in the transparent bar receives an electrical pulse from the alarm board. An end-of- line resistor also protects the bars if the electrical pulse is bypassed or bridged. Should the bars be kicked out, cut, melted or tampered with in an attempt to burglarize the property, the thin wire will break and instantly activate the alarm. Smart Bar technology is technology and innovation you can trust. The unique selling point of the Smart Bar product range is that it ingeniously combines two different branches of traditional security barriers to form one truly efficient security product. Armed Bars are transparent burglar bars fitted with Smart Bar technology that has the impressive ability to protect the home and inhabitants with physically strong, clear bars that are integrated with a 24/7 active alarm monitoring system. This will provide the client with a permanent armed perimeter protection. These aesthetically pleasing physical security barriers completely eliminate the imposing prison-like feel, that traditional, “third world” metal security barriers give. Armed Bars will provide the customer with the kind of freedom they deserve. ViewProtect range of products with its patented Smart Bar technology are only available through certified installers. These products are unparalleled in the security industry, and will provide the best possible protection to consumers with a “simple” solution. Our products are designed to be aesthetically pleasing, whilst still providing you the ultimate physical barrier by supplying an added benefit of a 24-hour alarm monitoring protection. This unique feature makes our products the most secure alarm sensor ever developed with easy installation benefits. ViewProtect has invested in the development of a user-friendly smartphone APP that allows our certified installers to complete their quotations on site. This captured data can then be uploaded onto the factory data base, ready for production within minutes. ViewProtect adheres to strict regulations on the standard of the polycarbonate products used, purchasing these products from ISO regulated companies. An independent test laboratory (University of Stellenbosch Institute of Structural Engineering) runs random tests on the polycarbonate products prior to the sale of ViewProtect Transparent Burglar Bars.